A question was posed to me recently: How many times did Walt fire Babbitt? In his later years, Art Babbitt was fond of saying things like “Disney tried to fire me five different times” for his union activity at the animation studio. First some clarification: it was Disney the company, not Walt Disney the person who tried firing him. And secondly, it wasn’t five times; that’s unreasonable. According to the National Labor Relations Board trial records, it was four times. On May 15-16 of 1941, there was a “layoff” of between 22 to 24 Disney artists, all of whom happened to be members of the Screen Cartoonists Guild, the local union. Babbitt was one of them. Firing #1. The union protested and so Babbitt (and the others, conceivably) were hired back on or around May 22. Babbitt led a union meeting on May 27 in which the SCG agreed to strike in 2 days unless Walt would agree to meet with their committee. According to Walt, the union didn’t have a majority of his artists, but according to the union, it did. That discrepancy may be from union honcho Herb Sorrell padding the numbers, but mostly of semantics. There were about 330 artists ready to strike, a good percentage of the total employees. 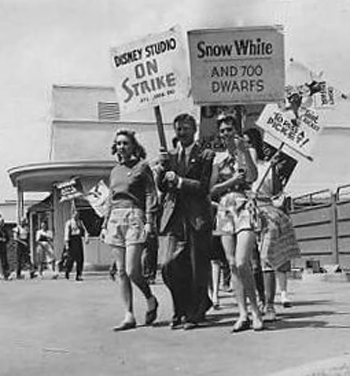 However, many employees were janitorial, maintenance, managerial, secretarial, security, etc., so while the strikers may have counted as the majority of the Artists, they counted as the minority of Employees, and Disney refused to recognize them. On May 28, Babbitt was escorted outside the studio gate by security, along with 17 or so other union member employees (including effects animator Cy Young). May 29 was the first official day of the Strike. Firing #2. On July 29, after additional pressure from the union, Babbitt received a note that he would be reinstated. This, they thought, would end the bitter Strike. In early August (August 12 according to historian Neal Gabler), because of limited financial resources, company managers drafted a proposed list of cost-related layoffs. The list had a disproportionate number of union members on it, including Babbitt. Firing #3. The union shouted foul play, and the Disney Studio agreed to bring in a federal arbiter. The Disney Studio temporarily closed down on August 18 until the arbitration was settled. It’s finally settled on September 17, and Babbitt is reinstated yet again. In November, a several Disney artists, including Babbitt, received a mimeograph at their animation desks that they’d be laid off. Firing #4. Babbitt would serve in the military for the duration of WWII, and finally resign from the Disney Studio in 1946. This entry was posted in 1941: The Disney Strike, miscellaneous, WWII and tagged NLRB, SCG, union. Bookmark the permalink.